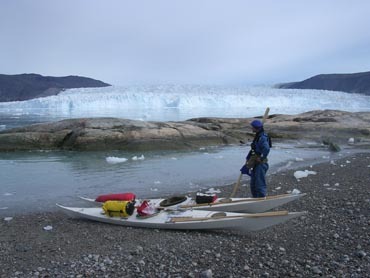 If a Greenland kayak has any weaknesses compared to modern kayaks, it must be the storage space. The wood frame takes up a lot of space, and gets in the way when you have to pack effectively. Originally, Greenland kayaks were only used for hunting, which mostly took place on day trips. The exception was mail delivery - which was done by kayak! There are also examples of kayaks being used for longer trips in earlier times, but the demand for comfort wasn't as great then as it is today. A portable stove and a rifle was usually all that was necessary when a Greenlander went on a voyage. 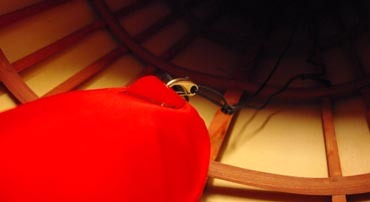 Present-day people who wish to use a Greenland kayak for extended trips will therefore face some challenges that the Greenlanders did not. 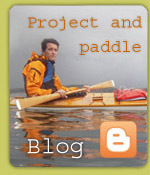 This article covers various approaches to packing a kayak for use on longer trips. This can also be useful for those who have modern kayaks! Willpower is critical to being able to pack your kayak! People have a tendency to fill all available space, so that regardless of the size of the kayak and the amount of baggage, there's almost always too little space. In my case there's almost always a pair of shoes left over, which I stuff down into the cockpit, only to be annoyed by them during the trip. You should always pack your kayak as though you were going on a long expedition. Then there'll be enough space. It's first and foremost a question of technique and the will to see it through. It should be unnecessary to mention that the first thing to do is to limit the number of items you're bringing. But... there are a lot of things that are handy to bring along, and you want a few luxury items too. But think through what you're bringing. According to the Swedish expedition paddler Jim Danielsson, everything you take with you should have at least two uses. There have been a lot of jokes about this over the years, but it's still a good point. For a Greenland kayak paddler it can mean the difference between struggling and relaxing. As an example, consider a foam mattress. You'll need one to sleep on during the night and one to sit on when paddling. Why not use the same one for both? If it becomes wet during the day, bring a piece of plastic to wrap around it at night - this takes less space, and you can save as much as 20 litres of space. Mesh bags are handy for carrying things like raingear. Most of the time I don't have much use for the pump, but I can use it to extend my arm 80 cm and get hold of bags lying far inside the kayak, beyond my regular reach. When packing you have to pay attention to the distribution of weight in the kayak. The general rule is to have as much weight in front as in the back, and put the heavy items closer to the middle and the light things as far out as possible. This will make the kayak behave well in high seas. The most important concept as we proceed is DIVIDING UP the baggage. Split up everything that can be split up. 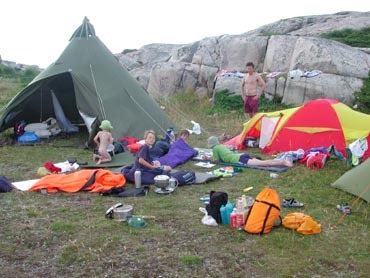 Tents, for example, can usually be divided into outer tent, inner tent, tent poles, and tent plugs - 4 small items instead of one large one that's hard to fit anywhere. If you also pack the fabric in a fairly large bag (or without a bag), it should be fairly easy to prod and shape it to fit next to several other pieces of baggage. Fuel is fairly easy to divide - use several small bottles instead of one large one. Small watertight bags of camping food can also be stuffed in among other items, and you can make a little food cache in the tip of the kayak, where nothing else will fit. When it comes to watertight packing bags it's also preferable to have several small bags rather than a few large ones. This also has other advantages. For example, you can divide the clothes bag into daily clothes, clothes for use later in the week, emergency spare clothes, etc. If you pack the infrequently used things towards the ends of the kayak, you won't have to unpack and repack as much. Anything you don't use should stay packed. Then you save both packing and carrying. Baggage that can be easily molded is also very handy. I've completely stopped using bottles - I only use water bags. You can buy them in kayak shops, but the bladders from boxed wine or the like work equally well, year after year. Other items that are easy to mold are the tent and sleeping bags. Compressing sleeping bags isn't always a good idea. You quickly end up with a hard little lump with a lot of unused space around it. 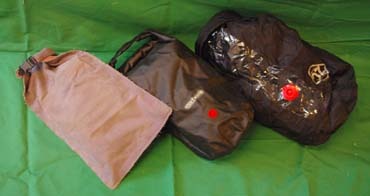 Different types of water bags. I think the apple juice bags in the middle are the best - easy to pour from quickly, drip-proof and with a great price! Remember to not fill them completely, or they'll be hard to mold. When you split up the baggage, however, you get a new problem - lots of little things to keep track of and carry to the beach, to the campsite, to the kayak, or to the car. IKEA has given us a solution in the form of the IKEA bag, which I recommend for solving the problem. But the sea sock works fine too. You can even sew a few straps on it and use it as a backpack. Another practical solution, which I am critical of, is deck baggage. I think it's important to keep the kayak deck clear of stuff. For reasons of safety and rescue there shouldn't be too many things here. On the other hand, sometimes you have no alternative. There are a lot of clever contraptions you can buy, too - and you can make some yourself. One of my favorites is conical stuff sacks. These are simple to fit into either end of a kayak. I eventually found out where to buy them, but before I was so lucky, I made them myselfâ€¦ The range of waterproof textiles is fairly poor here in Norway, but it's possible to be creative. I've used regular cotton fabric, which I've sewn pockets in, and then waterproofed them on the inside. Here you can use fabric glue, liquid latex, Plasti-Dip, Tech 7, and lots of others. Conical stuff sacks. On the far left a homemade cotton bag with inflation tube, so it can provide flotation. The tube can also be used in reverse when compressing baggage before. I finally succeeded in tracking down small, thin stuff sacks. Before I succeeded I usually used a rubber mattress cut up lengthwise along the grooves. The stuff sack on the picture was made from the pillow of an air mattress. I bought the mattress at a flea market for a dollar. I've been using it for 13 years now and it's as good as new. One option that I'm not a personal fan of, but which I know a lot of people use and are satisfied with: A string system attached to the kayak's frame right at the bow (or stern). You can attach the baggage with a hook and pull it out with the string. Check the string sometimes so that it doesn't fray while your sleeping bag is stuck at the far end of the kayak!! One of the last things I want to mention is compression stuff sacks with a valve. It can be really great, and making something 100% airtight by yourself is difficult. The German company Ortlieb makes an ingenious device, which you pack down, close, open a valve on, flatten, and close the valve. My sleeping bag ends up as a 5cm thick pancake, which keeps its shape all day, and which is easy to pack into even the smallest Greenland kayak - strongly recommended. Homemade stuff sack from an air mattress, and two compression stuff sacks. Finallyâ€¦ There's a philosophical aspect about going on a trip that's important to the question I raised at the beginning of this article: "How much stuff do we really need to bring?" You can go even further and ask "How much stuff do we really need at all to be happy?" I think the outdoor life gives us a unique opportunity to think about these questions. This is a natural consequence of having to consider every single thing we want to carry, pull or paddle with, when we leave for a trip. Having a good time is more often the result of being present in what you're doing, than the result of bringing a lot of things. Comfort on a trip is more often a consequence of planning, experience and acclimatisation to the conditions, rather than a consequence of having a lot of suitable equipment. To put it another way, it's not the things, but your knowledge about the things, that helps you towards a good and comfortable outdoor life. The Greenlandic culture is a shining example of how a people with minimal equipment and help managed to live in peace and prosperity despite one of the most challenging climates on Earth. The title of this picture could have been "Mission Impossible"! No, not at all. These two small Greenland kayaks have a complete set of gear and food for 14 days. The deck baggage will decrease during the trip until it's all gone.